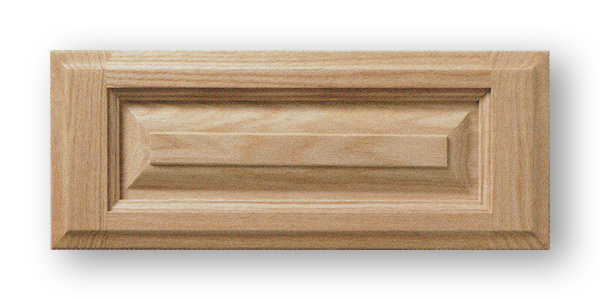 Poplar wood is generally straight grained with a fine, even texture. Creamy-white to pale brown heartwood and sapwood. Poplar varies from white to a light green with occasional black and purple streaks. Poplar is a relatively hard hardwood with good durability. 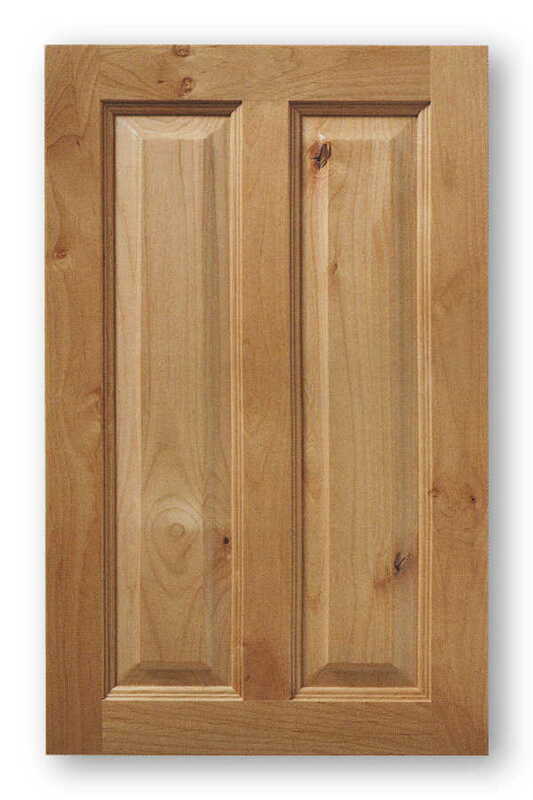 This door style has a solid poplar wood center panel. Alder wood is straight grained and even textured. Pale yellow to reddish brown with indistinct boundary between heartwood and softwood. Alder is an excellent choice for staining, as it will take a clear coat, or a light to dark stain very well. 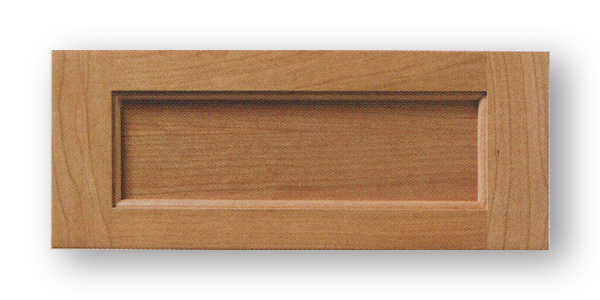 Has also been used quite commonly to mimic the look of cherry if stained and finished properly. Since alder is a straight smooth grain wood it also takes painted finishes very well. Ash wood is generally straight grained with a coarse texture. Pale-brown heartwood and almost white sapwood. Ash wood is a very hard and wear resistant hardwood. Ash does take stain well, but do to its rather coarse grain patterns it is not recommended for painting as this coarse grain will show under some painted finishes. Beech wood is a very hard hardwood with excellent wear resistance with straight or sometimes interlocked grain with a fine, even texture. Dark to light reddish brown heartwood and very thin, nearly white sapwood. Beech wood stains well, but is seen often with a glazed finish, it is also another ideal paint grade material due to its hardness and wear resistance and smooth grain, it takes paint beautifully. Birch is a relatively hard hardwood with good wear resistance. Birch is Straight grained with a fine even texture. Reddish brown heartwood and light-yellow sapwood. Birch is an all around good wood, stains relatively well also commonly seen with a glaze finish or more popularly clear finishes. Because Birch has a smooth grain it also is an excellent choice for painted finishes where a hard durable material is needed. Red Birch is a relatively hard hardwood with good wear resistance. Red Birch is Straight grained with a fine even texture. Red Birch has quite a reddish appearance similar to that of cherry. Birch is an all around good wood, stains relatively well also commonly seen with a glaze finish or more popularly clear finishes. Because Birch has a smooth grain it also is an excellent choice for painted finishes where a hard durable material is needed. White Birch is a relatively hard hardwood with good wear resistance. White Birch is Straight grained with a fine even texture. White Birch has a similar color tone to that of maple. Birch is an all around good wood, stains relatively well also commonly seen with a glaze finish or more popularly clear finishes. Because Birch has a smooth grain it also is an excellent choice for painted finishes where a hard durable material is needed. Cherry wood is a relatively hard hardwood with great wear resistance. Cherry is generally straight grained with a fairly uniform texture and a rich luster. Light to dark reddish brown heartwood and narrow, nearly white sapwood. Cherry takes stain very well and is regarded as one of the most highly prized cabinet woods in North America. Hickory is a very hard hardwood with tight, generally straight grain with a coarse texture. Pale to reddish brown heartwood and whitish sapwood. Hickory can be stained and finishes well, but do to its rather coarse grain patterns it is not recommended for painting as this coarse grain will show under some painted finishes. Maple is a very hard hardwood, with excellent wear resistance. Maple wood has a straight, close grain with a fine, uniform texture. Nearly white sapwood, sometimes with a reddish tinge and light tannish heartwood. Maple is very hard and can be stained, although it is seen with a glazed finish. Maple paints excellently and is a great choice for a durable material for painting. 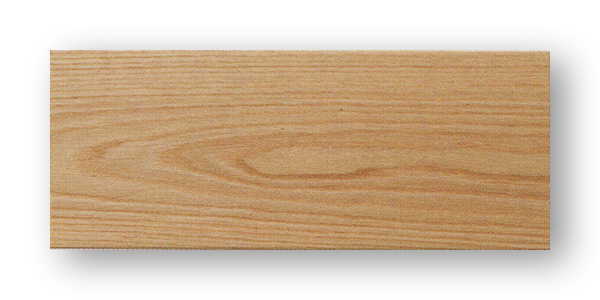 Clear Pine wood is straight grained, with a medium coarse texture. Clear Pine is free from any knots. Pine does stain well but it is recommended that a pre-stain conditioner or gel stain is used. Red Oak wood is a straight grained with a coarse texture and prominent rays. Light reddish tan heartwood and narrow, almost white sapwood. Red Oak is a very hard and durable hardwood with great wear resistance. Oak accepts stain very well, from light to dark. Due to its rather coarse grain patterns Red Oak is not recommended for painting as this coarse grain will show under some painted finishes. Red Oak Quarter Sawn wood is a straight grained with a coarse texture Light reddish tan heartwood and narrow, almost white sapwood. Red Oak is a very hard and durable hardwood with great wear resistance. Oak accepts stain very well, from light to dark. Quarter Sawn material is milled so that the growth rings of the lumber are near vertical (60 to 90 degrees), the cuts made cuts across the wood's ray cells yielding "ray-flecked" grain. Red Oak Rift Sawn Red Oak Quarter Sawn wood is a straight grained with a coarse texture Light reddish tan heartwood and narrow, almost white sapwood. Red Oak is a very hard and durable hardwood with great wear resistance. Oak accepts stain very well, from light to dark. Rift Sawn Red Oak is typically milled at a slight angle (30 to 60 degrees) from vertical producing a very straight grain pattern with almost no “ray-fleck” as would be found on quarter sawn material. Sapele wood is interlocked, sometimes wavy grain producing a distinctive figure on quartered surfaces. Medium texture, high luster, pale yellow sapwood and light red to dark reddish brown heartwood. Sapele can be stained although it is usually clear finished since it has a dark reddish brown appearance. Walnut wood is generally straight grained with a moderately coarse, uniform texture. Rich dark brown heartwood and nearly white sapwood. Prized in North America for high-end cabinetry and furniture. Walnut stains very well. Walnut can be painted but it does have a rather coarse grain pattern that would not be recommended for painted surfaces that require a smooth finish. Due to its cost and its natural beauty it is rarely painted. White Oak is an outstanding domestic hardwood that is a very strong wood that displays a very straight and consistent grain. Its unique cellular structure makes the wood highly water resistant, and it is therefore used in great quantities for exterior applications from trim and general construction to furniture and garden structures. The characteristic that has made White Oak famous is the presence of striking medullary rays that appear when the wood is quartersawn. Quartersawn White Oak is a highly stable material. In the early 1900s White Oak was the standard species for the arts and crafts movement in furniture building. White Oak is an outstanding domestic hardwood that is a very strong wood that displays a very straight and consistent grain. Its unique cellular structure makes the wood highly water resistant, and it is therefore used in great quantities for exterior applications from trim and general construction to furniture and garden structures. Rift Sawn White Oak is also typically milled at a slight angle (30 to 60 degrees) from vertical producing a very straight grain pattern with almost no “ray-fleck” as would be found on quarter sawn material.